School holidays are over and my boys are back to school from today. 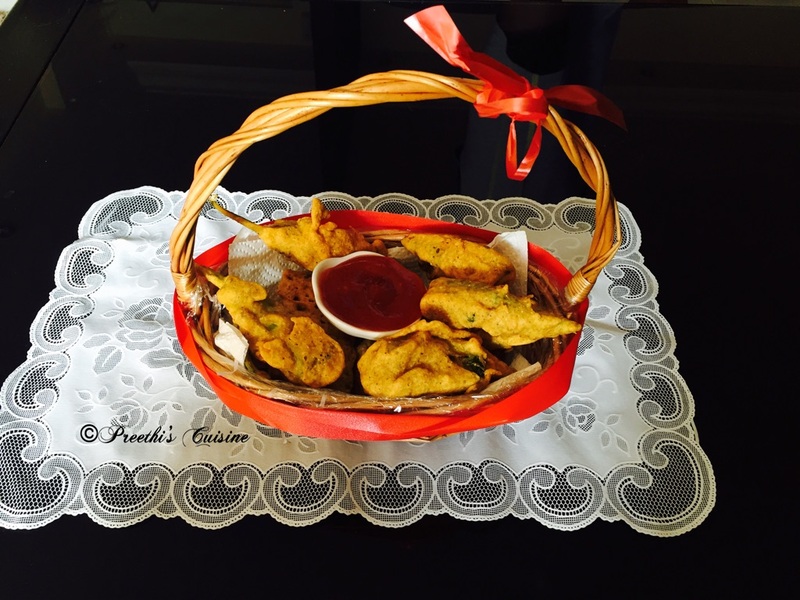 Celebrating the last day of their holidays with an unusual Ambode recipe from my hometown. I have tweaked in a little by adding multigrain powder and banana blossom that makes the amobode more crispy ,crunchy and tasty. Our 99th #Foodiemonday #Bloghop theme is #Flowerrecipes and my contribution to this wonderful theme is Multigrain Banana Blossom Ambode . Soak channa dal for about 2.5 to 3 hours. Remove the tough reddish leaves and florets of the banana blossom one by one.Beneath these leaves there is a row of delicate yellow-tipped florets that can be removed and immediately soaked in butter milk to avoid discoloration and bitterness.The florets are part of a tedious cleaning process.Pluck the matchstick-shaped pistil and soak the cleaned florets in butter milk again. Grind and make a fine paste of Coriander ,jeera ,ginger ,green chilli and red chillies .Tranfer this mixture to a wide bowl. Now Coarsely grind channa dal and add it to the chilli coriander mixture. Now add hing, salt , multigrain powder , chopped florets and mix well. Add a tbsp of sizzling hot oil and mix well. Take a small quantity of mixture ,shape it into a round flat patty and deep fry until both the sides are golden brown. Serve with any chutney or sauce of your choice. I enjoyed them with curd rice. Clean the florets properly and ensure to remove the pistil. Immediately soak the cleaned florets in butter milk to avoid discoloration and bitterness. I love baked goodies as they are healthy and can be eaten guilt free too. 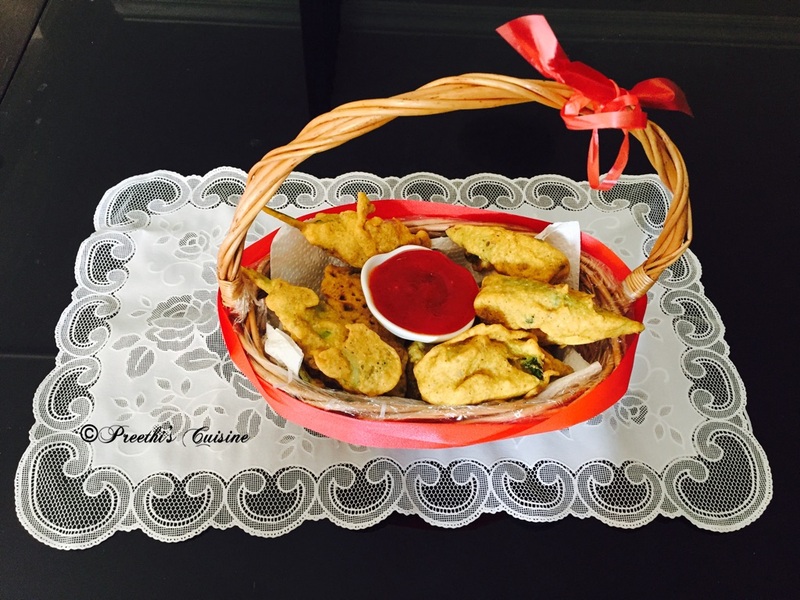 I have used the ready made Pastry sheets for this yummy snack after a long time. The baked Potlis were finger licking good and vanished in a jiffy once out from the oven. Well the secret ingredient here is Mango thokku. An easy snack recipe that will be loved by both kids and adults. Mix the corn flour and water to get a thick paste.Keep it aside. Remove the Frozen pastry from the refrigerator. Heat 2 Tsp oil in a wok. Add Jeera and saute. Add the chopped onion and grated ginger and roast on low flame until the onions turn slightly brown.Once done add the mashed potatoes and mix well. Add Mango thokku and rasam powder and mix again. Add the chopped coriander and salt. Mix again and keep it on low flame for about 8 to 10 mins. Take a single pastry sheet add about a tsp of the above filling and bring the edges together. Apply the corn flour paste so that the edges stick to each other and insert a tooth pick. Pre heat the oven at 190C for about 10 mins. Place the tray with these potlis in the middle rack of the oven and bake for about 20 mins. They will turn slightly brown and crisp. Once done ,remove from the oven and serve with any chilli sauce or green chutney . 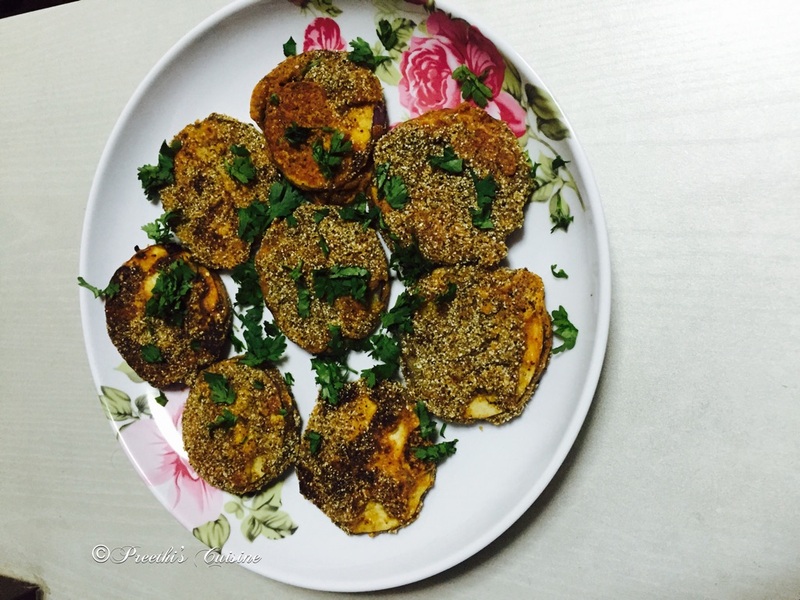 This is my contribution for the Sonal’s Collective on Semi Homemade dishes.Do check out her blog http://simplyvegetarian777.com/ for some easy and healthy recipes. I was introduced to this yummy street food during my Stay in Vizag. It is one of the most popular spicy street food that I have ever had. My family loves to have it. I hardly make fried stuff at home but once in a while I don’t mind pampering my family and myself with fried stuff. Being a weekend and on the occasion of Rakshabandhan I made these Stuffed Multigrain Chilli Fritters. It was lip smacking . Worth a try and I am sure you will fall in love with these bombs.I have made these with my own variations. Enjoyed with my Masala Chai. Saturday bliss!! Wash the chilli,slit it ,deseed and keep it aside. Mash the Boiled Potatoes. Add chaat masala, chopped coriander,salt to taste.grated ginger,Ajwain /Carom seeds and mix well. Stuff the chilli with this mixture. Add besan,chilli powder, Roasted green gram powder,Roasted Flaxseed Powder, Roasted Chia seeds Powder, Roasted Quinoa Powder,Sooji and Jeera /Cumin Powder. Heat about 5 tsp oil in a pan. Add the sizzling hot oil to this flour mixture. Mix well. Add water and make thick batter. Add salt to taste. Heat oil in a pan for frying. Dip the stuffed chilli in this mixture and deep fry. Serve hot with green chutney or sauce. I love multigrain and like to use it in my recipes as and when possible. The Coarsely powdered Multigrain adds a nice crunch to the dishes that are especially roasted, baked or fried. 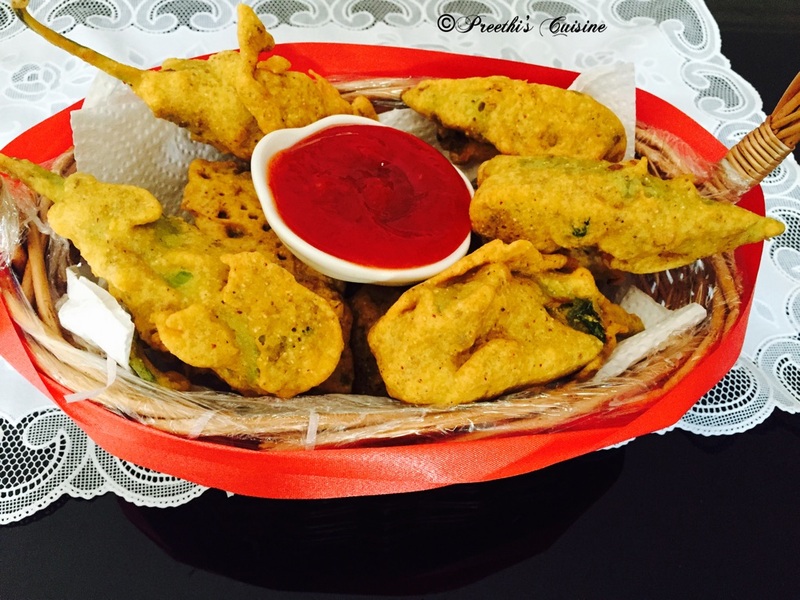 A healthier version of Bajji that are shallow fried with minimal oil. 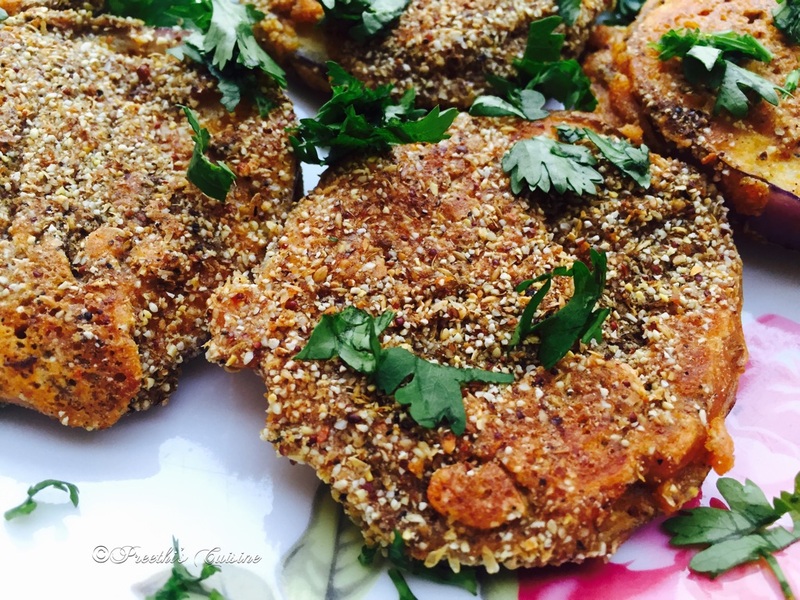 Easy to make and guilt free to relish .I love to have these with my hot cup of Masala Tea when its pouring outside. An all time favourite at my place. Best eaten hot. I will try the baked version soon. 3 Tbsp Multigrain powder mix(Slight roast and coarsely powder Quinoa,Chia seeds,Flax seeds-(1 Tsp each) Green gram (2Tsp)). Mix Besan / Gram Flour, chilli powder,salt, hing/asafoetida,jeera/cumin, garam masala, coriander. Add 1 Tsp of sizzling hot oil to this mixture.Mix Well. Add water and make a thick paste like you make for Bajji Batter. 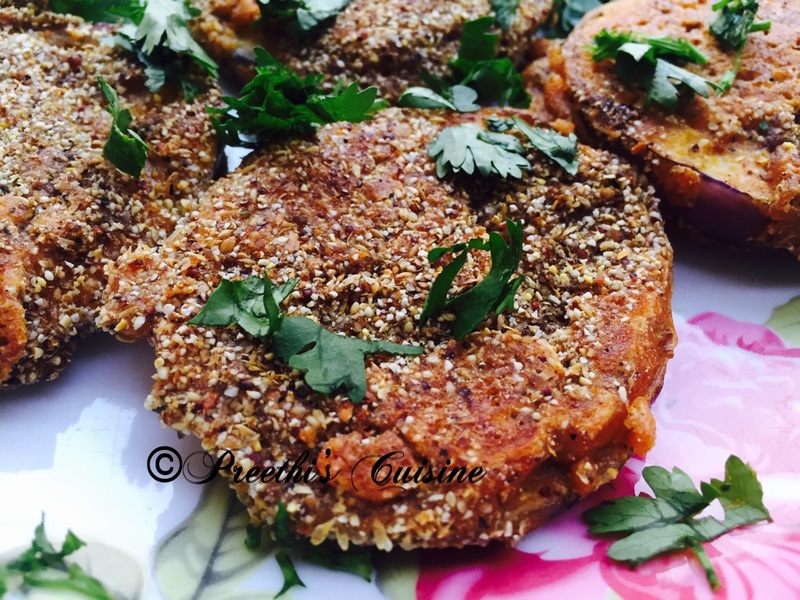 Dip the cut Brinjal rings in this batter and tap it on the multigrain powder on both sides. Heat 2 Tsp oil (You can add more if you like)in a pan .Please these rings and roast on both the sides for 2 to 4 mins on both sides on medium flame. 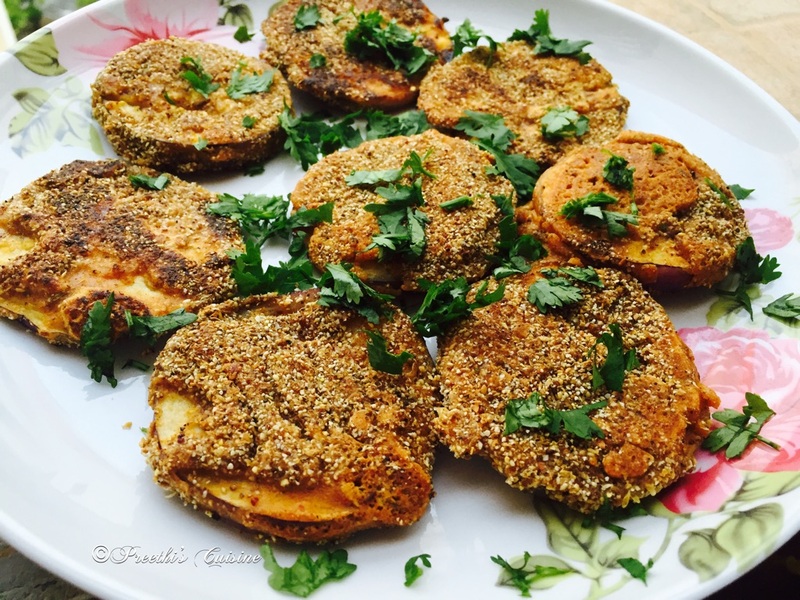 Multigrain Brinjal Rings are ready.Serve hot with Green Chutney. PS: Multigrain -Each item is raosted , coarsely ground separately and then mixed. Today is Indian Independence day . An Important day for all our fellow Indians to renew our vow for working towards the betterment of our Motherland. On this historic day ,I have another reason to celebrate . Its a small milestone as this is my 50th post on my blog. I owe it to all my family and friends who have encouraged and supported me to reach here. I would like to thank each one of you and dedicate this post to all of you for your immense support. As you all know I try and experiment different cuisines(Vegetarian). I was introduced to this Ghee Roast Masala by a Manglorean friend. I made Ghee roast masala at home and started experimenting. A very simple,Easy and yummy dish to prepare. You can substitute with Paneer , Potato or mushroom. A great Starter which your guests will love. 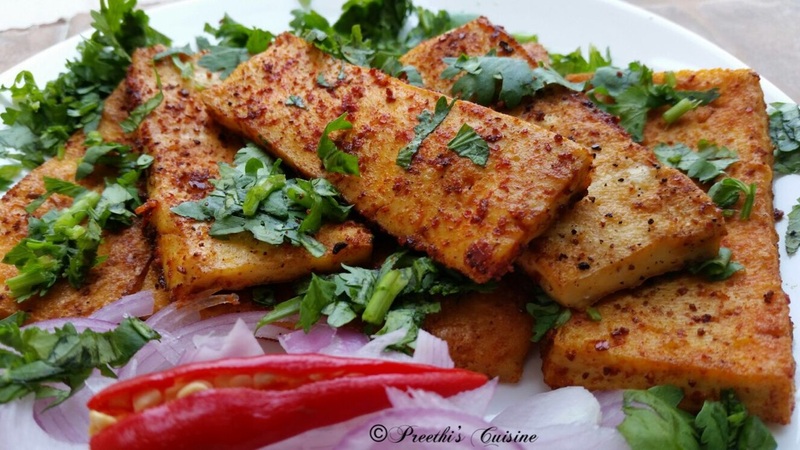 Recipe for Pan fried Tofu ghee roast masala. 2 Handfuls of fresh garlic, keep the skin on. Take firm tofu cakes and slice them into thin strips. Smear some ghee and grill for 10 Mins at 180C for 10 Mins. Make a thick paste of the above Ghee roast powder by adding a little water. Add salt to taste and 1/4/ Tsp Amchur powder(Dry Mango Powder) . Mix all the ingredients together. 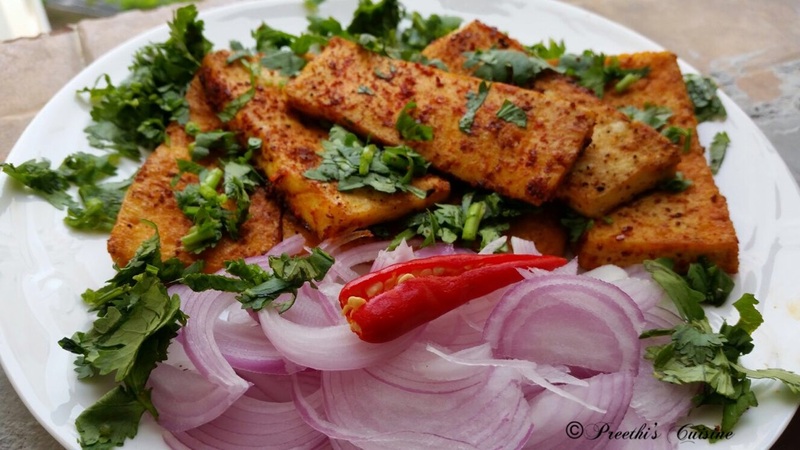 Dip the tofu strips in the masala and ensure the masala is smeared evenly. Heat 2 Tsp of oil in a pan. Place the masala coated Tofu strips in the pan. Roast on slow fire on both sides and ensure it does not burn. Just 5 Mins on each side. Pan fried tofu is ready. Garnish with coriander and serve with freshly chopped onions or raw salad. I am sure you cannot stop at one.